So, I may have missed my mid-week post this week. I actually have quite the archive of recipes to get up here, it’s just finding a chance to sit down and put pen to paper (err… fingers to the keyboard?). But, since it’s Friday, that means it’s time for some Friday favorites! I guess the big news around here is that the hubbs finally talked me into training for and competing in a triathlon with him. As of last night, we are both officially registered for a Half-Ironman triathlon in October. Yes, that is a 1.2 mile swim, 56 mile bike, and 13.1 mile run, and there is still part of me that thinks this is crazy! I’ve been spending a lot of my free time this week looking up training schedules. The good news is we have plenty of time to train. The bad news – I hate the freestyle. I actually use to swim locally, but the freestyle was never my thing. I was more of a backstroke/breaststroke gal which brings me back to the good news. I have plenty of time to train. Not a lot of plans here for the weekend. We’re actually both working Friday-Sunday. I’m noticing that this is very dessert heavy this week. Maybe I’m already looking forward to all the training? 🙂 Hope you have something great in the works for your weekend! Enjoy! Favorite Caramelized Desert. 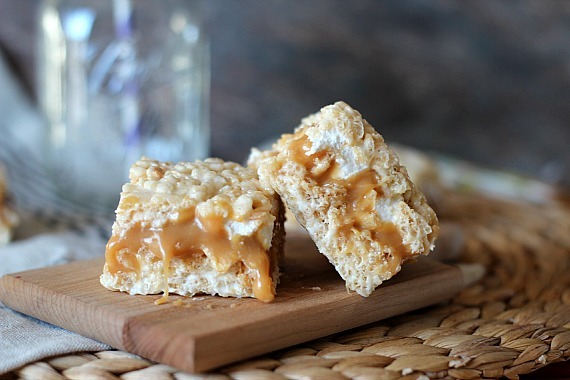 Caramel Stuffed Krispie Bars by Cookies & Cups. In college, my roommates and I used to make rice krispies with some frequency. These? These are like rice krispies on steroids. I’d eat almost anything covered in caramel. Favorite Home Update. Outdoor Entry by Love Your Room. 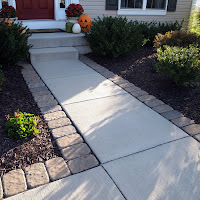 I love how simply adding pavers along the concrete updates this entry. This is a DIY home project I may actually be able to handle. Favorite Green Food. Avocado Egg Rolls with Chipotle Ranch Dipping Sauce by Big Flavors from a Tiny Kitchen. This may be the green food I serve for St. Patrick’s Day, although I’m not sure I need to make up an excuse to make these. Favorite Easter Candy Bake. 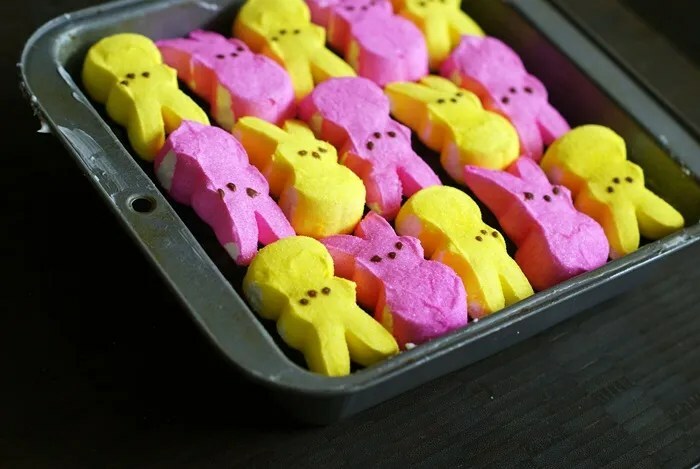 Peeps Show S’mores Bars by Bake at 350. I am and have always been a Peeps lover, thus I usually consume them before I have a chance to bake with them. Looks like I may need to stock up so I’ll have leftovers to make these! Favorite Flooring. Wood Grain Tile Bathroom by A Home In College Hill. We have been wanting to re-do the flooring on the main level of our home for a couple months now. The big question has been tile or wood? I am loving the look of this tile! Favorite Furniture Makeover. Wicker Storage Basket Dresser Makeover by Art is Beauty. Oh if only I was a little crafty. Favorite Easter Dessert. 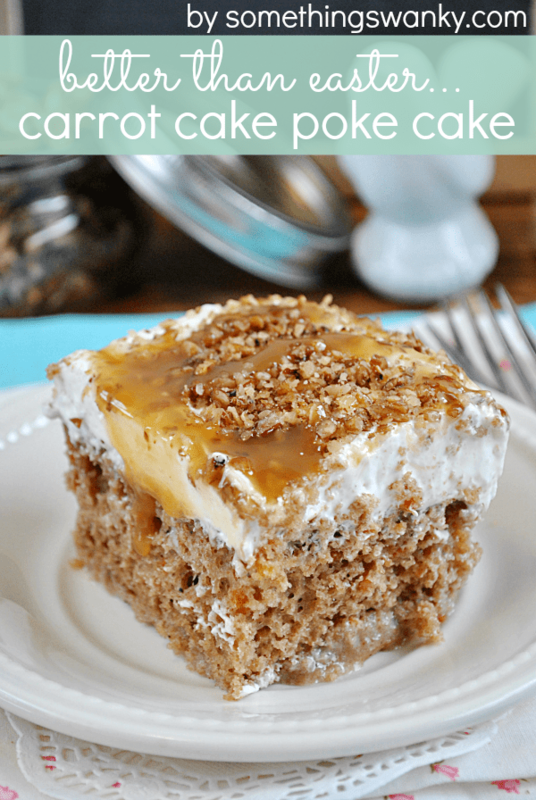 Carrot Cake Poke Cake by Something Swanky. I may actually be able to forgive the use of whipped cream as frosting on this cake. Looks so good!